INNOVATION = PRECISION = BEAUTY. These three words are the cornerstones of Dr Ilias Marinopoulos' philosophy. Thus, he works for some of the most prestigious clinics in London. The extremely high standards of Greece education have enabled him to reach international recognition. He can transform the most challenging cases, using the latest invisible technology. Ilias graduated from the University of Athens Dental School in 2002 - followed by three years in a military hospital. He then decided to continue his education at one of the world's leading universities in dentistry - The Royal University of Aarhus, Denmark; where he gained expertise in the most challenging and complex orthodontic cases. Still feeling that he could refine his skills even further, Ilias reached the level of orthodontic specialist in Sweden. In 2006 he underwent his specialist registrar training in the University of Gothenurg, Sahlgrenska Academy. In 2009 he qualified for his speciality studies and the following year finished with his MSc degree with distinction - on the gingival chemical mediators and their correlation to external apical root shortening, studied on 3D radiographs. 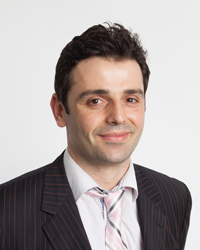 Ilias strongly believes that every face has a hidden natural beauty to reveal and is passionate about facing the challenges of complex orthodontic conditions. He specifically tailors each procedure for the best aesthetic long lasting results using the most comfortable aesthetic systems in the world.